Then follow the steps shown below. If you are lucky you wont need to refer Section A of this post at all. I did not have to do that !!! S-Video did not work out of the box on ubuntu Sony Vaio combination but it was not difficult to have it sorted once the following steps were taken. 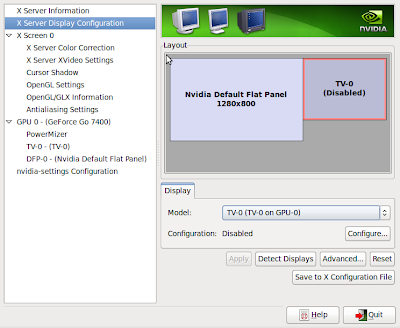 I am giving the steps to set-up TV-Out assuming your n-vidia file is working fine, if not follow steps in Section A before completing steps below. Step 1: Connect laptop and TV through S-Video Cable. 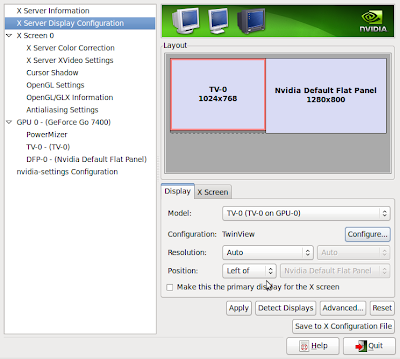 Step 4: Click on the TV icon, following screen will appear. 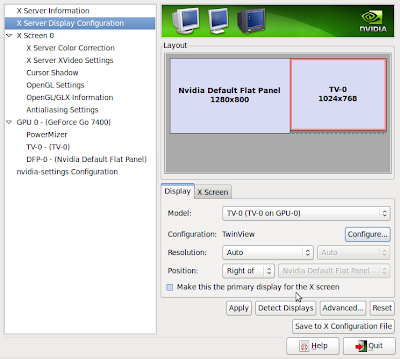 Step 5: Click on "Configure" and then select "Twinview"
Step 6: Now I found that keeping TV on left ensured that while using dailymotion full screen it will come on TV but keeping on right it came on laptop monitor so you may want to depending on your preference change the location to left as shown below. I found the most useful instructions below, but I did have to make few tweaks. Right, I will walk step by step based on the guide from the source mentioned above and mention the changes / tweaks I did to make it work on my laptop. I am sure it should work with same conf on other VAIO as well. Step 3: You will need to enter password at this stage. Enter the password. The numbers between @@ represent Row number and column number. - stands for old and + for new. 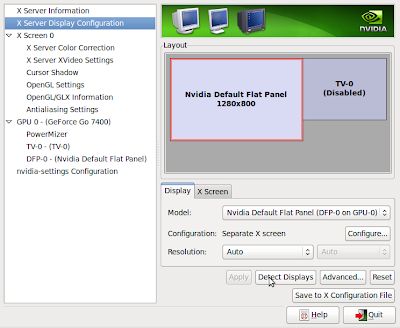 + ModelName "Nvidia Default Flat Panel"
# Removed Option "TwinView" "0"
# Removed Option "metamodes" "DFP: nvidia-auto-select +0+0"
+# Removed Option "TwinView" "1"
+# Removed Option "metamodes" "TV: nvidia-auto-select +0+0, DFP: nvidia-auto-select +1024+0"
- Option "metamodes" "TV: nvidia-auto-select +0+0, DFP: nvidia-auto-select +1024+0"
+ Option "metamodes" "DFP: nvidia-auto-select +0+0"
ModelName "Nvidia Default Flat Panel"
# Removed Option "TwinView" "1"
# Removed Option "metamodes" "TV: nvidia-auto-select +0+0, DFP: nvidia-auto-select +1024+0"
Option "metamodes" "TV: nvidia-auto-select +0+0"
Option "metamodes" "TV: nvidia-auto-select +0+0, DFP: nvidia-auto-select +1024+0"